For people getting into the format, Pauper can seem like a strange land. It’s a format made up entirely of common cards and primarily is played on Magic Online. However, for those of you new to the scene, there are strategies and archetypes within Pauper that can be seen in Standard, Modern and Legacy. 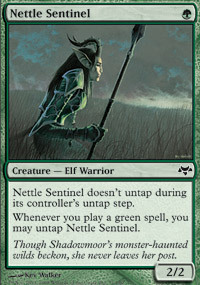 Pauper has aggro decks, grindy midrange decks, true control decks, big mana decks and even a combo deck or two left. Like other formats, there are also defined tiers of decks, based on performance and popularity. Often, these tiers are defined by the power and consistency of certain decks, but in today’s information age full to the brim with a cascade of deck ideas, not-so-secret tech and matchup data, we see a number of decks defined more by popularity than power. Personally, I define Pauper into three tiers. Tier One decks are at the top of the metagame in both power, performance and popularity. Tier One was defined by Esper Familiar and Cloud of Faeries-powered Delver decks prior to the most recent slate of bannings. Tier Two decks are similar, and they have two of the requirements, either power, performance or popularity. Often, Tier Two decks are great metagame calls. Tier Three is where I put everything else. This last place contains everything from the eight-color brew your buddy has to a deck that occasionally 5-0s a league. These decks often have power and a strategy, but they lack the overall numbers and performance. It should also be noted that over half of the Pauper decks you see fit into this category, because Pauper, due to its low-cost of entrance, is often a breeding pool for weird brews, strange combos and new players learning the game. I gather most of this information on MTGGoldfish, information posted by Alex Ullman and the Pauper League 5-0 decklists WOTC publishes. It’s mostly arbitrary, but for those coming into the format, I hope this proves to be a useful batch of information. Please, feel free to let me know what you end up thinking and where you place certain decks on your own criteria. The current top of the metagame is rather diverse. Affinity and Izzet Blitz represent a couple of the few remaining viable “combo” options left in the format, with the former having access to Atog and Fling and the latter having Temur Battle Rageand a slew of instants and sorceries. 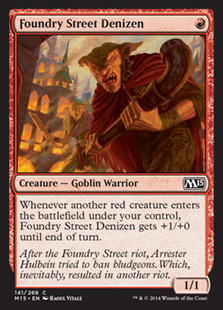 Affinity has the option of combo-killing and opponent, but 0 and 2 mana 4/4s are also a difficult strategy to combat. Control is often too slow to combat it, but red mages shouldn’t forget to pack Gorilla Shaman in the sideboard. 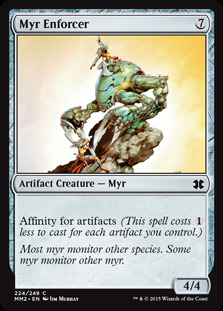 A four or five color manabase also allows Affinity a wide range of options in the sideboard, from Hydroblast and Pyroblast, to Armadillo Cloak. Izzet Blitz is a linear, powerful strategy that has been well-represented throughout its history in Pauper. 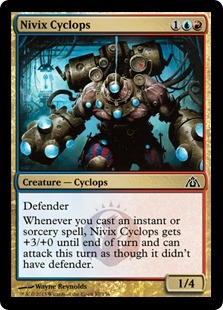 The printing of Nivix Cyclops in Return to Ravnica coupled with the arrival of Temur Battle Rage in Fate Reforged gave the deck a shot in the arm. The strategy is simple, but mastering the deck is not. Correct use and sequencing of threats, Gush, Ponder and even Gitaxian Probes can spell the difference between victory and defeat. 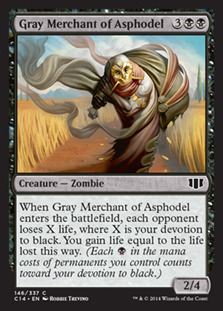 For those more in the midrange camp, Kuldotha Jeskai offers everything you’d ever need. It draws a ton of cards, has great one-for-one removal and eventually buries opponents in card advantage with the potential to kill from a distance in a flurry of burn. 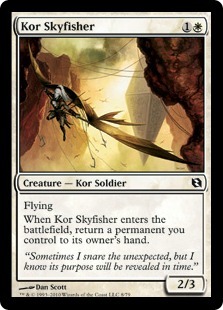 Kor Skyfisher and Glint Hawk keep the cards coming in concert with Ichor Wellspring and Prophetic Prism. 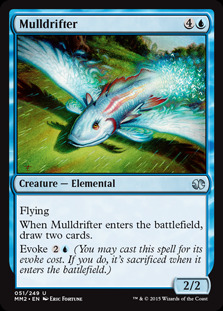 The deck's third color brings with it Mulldrifter and in some cases Perilous Research and Izzet Chronarch. 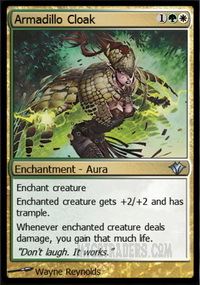 Temur Tron is the big mana deck of the format, showcasing the power of early Mulldrifters and Ulamog’s Crusher, with the inevitability of Rolling Thunder and Haunted Fengraf. What the deck sometimes lacks in consistency, it makes up for in raw power. Assemble Tron and you can go places, usually in the win column. Delver is your prototypical tempo strategy. Land an early threat and protect it. 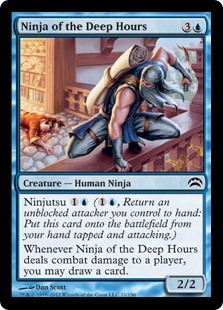 Ninja of the Deep Hours is still a fantastic card when coupled with Faerie Miscreant or Spellstutter Sprite. Spire Golem still has four toughness and blocks almost everything. 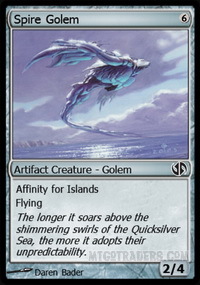 Even with Cloud of Faeries gone, Delver is still powerful in today’s metagame, something I’m personally rather fond of. Tier Two contains the format’s two premier red decks in Burn and Goblins, as well as the old-guard Mono Black decks, UB Control decks and aggro-control UB Angler lists. These decks all have powerful strategies, but they often prey on each other or have poor matchups with Tier One lists. Not to say these aren’t completely fine, as Pauper is an eternal format, and someone who has mastered their craft with one of these lists can easily perform consistently well. Goblins is one of the most consistent decks in the format. It manages to run eight effective copies of a few cards, giving the deck plenty of redundancy while having a linear strategy and tools to control the board. It’s a difficult deck to master, as the lines are often more complicated than you would think. And then sometimes you draw a bunch of (Goblin War Marshal)s and (Goblin Bushwacker)s. The list is tight, but you'll find the numbers can change between lists and sideboard slots can fluctuate depending on the metagame. Burn’s strategy in Pauper is very much the same as it is in other formats. 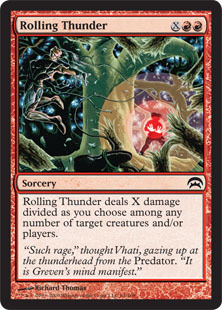 The pilot is looking to count to seven, casting seven Lightning Bolts to deal 21 damage and kill an opponent. 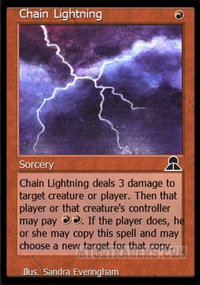 With Lightning Bolt, Rift Bolt, Shard Volley and Chain Lightning, the deck can be very lethal very fast. Fireblast gives the deck a tremendous amount of reach with Curse of the Pierced Heart offering inevitability. Searing Blaze deals with enemy dudes and the low creature count in traditional Burn turns off an opponent’s removal suite. Mono Black is a classic of the format. People have been playing Swamps and casting Chittering Rats on turn three since the birth of Pauper. The deck is probably one of the more represented archetypes in all of Pauper. Solid removal coupled with a powerful end-game powered by Gray Merchant of Asphodel makes Mono Black a very potent strategy, especially if played correctly. Sign in Blood digs deeper into the deck very efficiently and cards such as Cuombajj Witches provides repeatable removal along with two pips for devotion. One of the newer additions to the format, UB Angler or Turbo Angler comes in a variety of forms, some focused entirely on killing and countering relevant spells while cleaning up with a big Gurmag Angler, with others utilizing a Mystical Teachings package. This deck surfaced following the printing of our favorite Zombie Fish: Gurmag Angler. 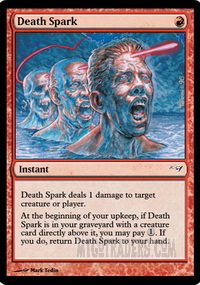 Coupled with Thought Scour, Mental Note, cheap instants and sorceries, the deck has numerous turn-one plays, such as Delver of Secrets, and applies massive pressure early. This deck showcases how Pauper, despite being an eternal format, still has room to grow with new sets. 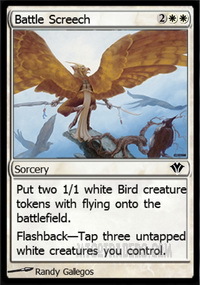 The format’s classic control deck. UB Control, Dimir Teachings or UB Teachings can be crafted to fit a number of playstyles. 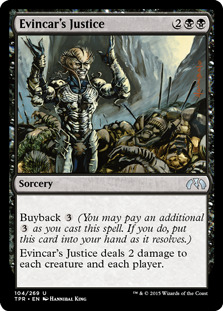 There are creature-less builds focused entirely on winning with Evincar’s Justice and Pristine Talisman, builds that use Grim Harvest and Crypt Rats, as well as more tap-out control style decks with cards such as Consult the Necrosages. If you want to play a control deck, this is where you should start. Mystical Teachings gives the deck a toolbox of answers, ranging from Agony Warp, Doom Blade, Counterspell, Exclude and ways to get ridiculously far ahead, such as Crypt Incursion. Tier Three is where I group everything else. These are the decks that again, have plenty of power or a synergistic strategy, but don’t have the consistent performances or the number of pilots. Popular decks in this tier include Stompy, GW Boggles, Elves, Mono White Tokens, White Weenie, UW Acid Trip, Tortured Existence and more. These are decks that can easily beat the top tier of decks, but lacks something or has certain bad matchups. Some of these decks, like Stompy, have weeks where they are the perfect metagame call and can truly shine. Also included in Tier Three are the brews. Pauper is a wide, diverse format with plenty of room for creativity. As long as your strategy has a game plan for the top decks on this list, you can find success. 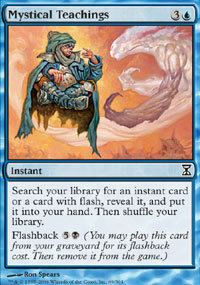 Furthermore, as the format is eternal, those who put in the work and tune a deck can find consistent success. My favorite people in this format are the pioneers who really work on their brews, tune them and showcase the power of underplayed cards. 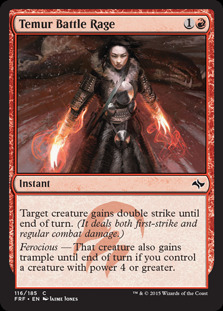 Even in the modern MTG world, where limited drives the design of commons, we see new cards impacting the format. Gurmag Angler shifted the format massively, with Treasure Cruise's impact being heavy enough to warrant a ban. Out of our return to Zendikar, we landed more creatures featuring the Landfall mechanic, as well as potentially powerful recursion cards such as Corpse Churn and Pulse of Murasa, the latter quickly becoming one of my favorite cards in a number of decks. As more of these cards are printed, we'll see new decks crop up, along with old favorites finding better pieces or increased redundancy. The best part of Pauper is how open it is. If you haven’t checked the format out yet, I can’t recommend it enough. It’s affordable, fun and the community is solid. 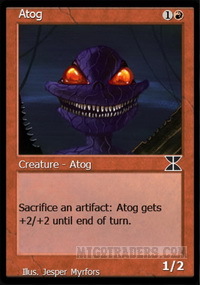 Most of the decks I've featured will run anywhere between 20 to 50 tickets, depending on sideboard cards and printings. Be sure to pick up the essentials and you can always work your way into the more expensive sideboard staples, but on the plus side, certain cards like Hydroblast, while expensive, slot into plenty of sideboards. There are plenty of decks to choose from if you’re looking to play a specific archetype as well as a ridiculous amount of room to brew. If you're not quite ready to jump right into League play, sign up for the weekly Pauper Classic Tuesday tournament held at 8 p.m. EST. The player-run event is quite popular and provides three to five rounds of competitive play coupled with a cut to top eight and a chance for prizes. The event is free of charge and is a great way to get involved with a part of the Pauper community. Get out there and play some commons.